The St Endellion Music Festivals take place at Easter and in the Summer every year, bringing together a wide range of musicians from all over the world to perform opera, choral, orchestral, chamber and recital concerts in the inspiring and intimate atmosphere of the Collegiate Church of St Endellion, North Cornwall and surrounds. St Endellion is near Port Isaac, about a mile from the glorious North Cornwall Coast. Each year a community forms out of the shared desire to experience music for the sheer joy of it. What makes the Festivals special is that at the heart of everything is an immense spirit of generosity. The aim is to create the best Festival possible on the smallest possible budget – therefore the musicians and singers, the stage managers and administrators, the cooks and washers-up all give their services for free. 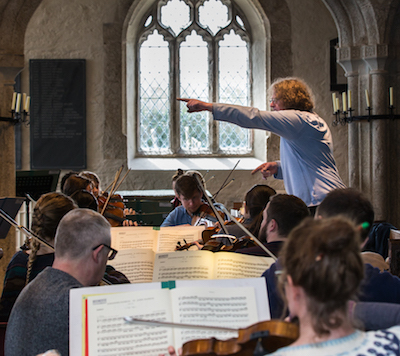 The chorus and orchestra all contribute to the cost of accommodation and the balance is raised from the box office and the Festival Friends scheme. Ticket prices are kept as low as possible and the aim is to break even, with any surplus being put towards future festivals. Somehow the freedom from commercial constraints and from the pursuit of success enables every performer to rediscover why music is so important – it forms bonds, it connects people, it speaks as Beethoven desired “from the heart to the heart”. Rather than sharing an expensive bottle of wine in a posh restaurant, St Endellion is like finding a fresh mountain spring on a warm summer’s day and taking great gulps of the most delicious drink imaginable. The St Endellion Summer Festival was founded in 1958, when a musical priest, Roger Gaunt, was inspired to invite a group of college friends down to help him renovate St Endellion’s derelict rectory. Slowly the festival grew and evolved from a group of friends putting on small-scale concerts and an annual play to include an orchestra and a chorus. And from the ranks of its enthusiastic participants emerged a young Cambridge graduate and organist - Richard Hickox - who became Artistic Director in the mid Seventies, when he also instituted a sister festival at Easter. Under Richard’s baton the festival developed and its reputation grew, and he remained at the helm until his premature death in 2008. The Summer Festival has entered a new chapter and goes from strength to strength under the leadership of Artistic Director Mark Padmore, whilst still remaining true to the foundations laid by Richard. Concert performances of opera have become a popular tradition; Endellion operas include The Rake’s Progress, The Magic Flute, Ariadne auf Naxos, Gloriana, Tannhaüser, Die Walküre, Peter Grimes, Carmen, La bohème, Gloriana and Boris Godunov, with Sir John Tomlinson in the title role. The Easter Festival has grown no less and was chaired from its inception until 2016 by its co-founder Fran Hickox, who latterly was also Festival Director. With a slightly shorter rehearsal period, and taking place at a very different time of year, it has a different kind of focus and concentrates more on smaller-scale orchestral works – although larger-scale works also feature on a regular basis. Always falling in Holy Week or the week following Easter, the programming reflects this special time of year, and the Festival is renowned for its performances of the Bach Passions - whose intensity in the church’s intimate setting can match anything experienced on the summer festival’s opera nights. Copyright © 2019, Endellionfestivals. Theme by Devsaran.